"CJ, a 3-year-old male German shorthaired pointer, won Best in Show at the 140th annual #WKCDogShow, which was held last night at @madisonsquaregarden. To take home the night's big prize, CJ squared off against the 6 other group winners. His competition included: a German shepherd, a Skye terrier, a samoyed, a borzoi, a bulldog and a shih tzu. CJ is the first Sporting Group winner to take Best in Show since 2009, and the 20th from the group to win over all. @samuelhodgson photographed CJ's moment in the spotlight while on #nytassignment at the @westminsterkennelclub event. 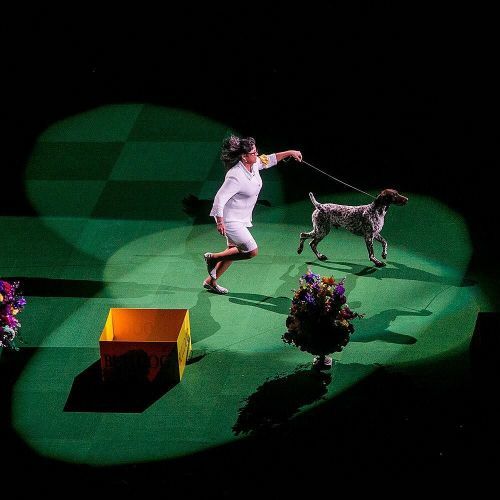 Follow @samuelhodgson and @nytimessports to see more photos from the #WKCDogShow. #🐕 #🐾" By nytimes on Instagram.